This is how Comet Hartley 2 might appear in the eyepiece of a large amateur telescope. Located about eight degrees (16 full moon diameters) away from the bright star Procyon as it leaves the constellation Gemini, Comet Hartley will be best viewed high in the sky just before dawn. Stunninglybright fireballs created by meteors from Comet Hartley 2 have amazedskywatchers across the United States lucky enough to spot them. Thepeanut-shaped comet, which was visitedby a NASA spacecraft yesterday (Nov. 4), made a close pass by Earth on Oct. 20and apparently created a new meteor shower of dust this week. "Isaw a bright white ball and tail, arcing towards the ocean," said skywatcherHelga Cabral of Seascape, Calif., who spotted a fireball at 9 p.m. local timelast night (Nov. 3). "It was quite beautiful and it looked like it washeaded out to sea and so picture-perfect it could have been a movie!" Thefireballs are caused by meteors that burn up in Earth's atmosphere before anybits can reach the ground. Ameteor is an object that flares up in Earth's atmosphere. If a piece reachesthe ground, it is called a meteorite. Before they encounter Earth's atmosphere,these objects are known as meteoroids. Comet Hartley 2 is a periodic cometthat completes one trip around the sun every 6 1/2 years. 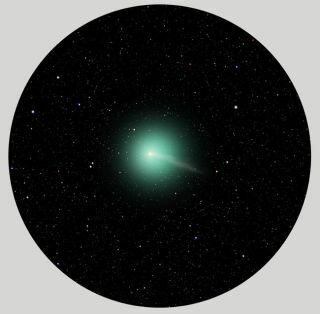 The comet is smalland was discovered in 1986 by Australian astronomer Malcolm Hartley. Earliertoday, NASA's Deep Impact spacecraft zipped within 435 miles (700 kilometers)of Hartley 2 - the fifth up-close cometflyby ever? and has beamed back stunning photos of the icy wanderer. It was the secondcomet flyby by the Deep Impact spacecraft, which visited Comet Tempel 1 in2005. Lastweek, NASA meteor experts predicted that the chances of seeing any meteors fromComet Hartley 2 would be slim, but said that if they were visible, the besttime to see them would be this week. At the time, Comet Hartley was withinabout 12 million miles (19.3 million km) of Earth, officials with the Centerfor Astrophysics said. "Iwas in the Revere area about 7:15 last night, driving north on Route 1, when abrilliant object with a tail passed in front of me ? very similar in appearanceto a shooting star, but it appeared much lower to the Earth than a typicalshooting star would be," said skywatcher Teresa Witham, who spotted thefireball late Tuesday from just north of Boston. "If it weren?t for thefact that I had my daughter with me, I'd begin to believe I?d imaginedit." Anymeteors from Comet Hartley 2 would appear to emanate from a point in the skynear the bright star Procyon in the constellation Canis Minor, near Orion theHunter, which is high overhead in the early hours before dawn. Cometsare well-known sources of meteor showers because they can sometimes leavetrails of debris streams near Earth's orbital path. When Earth passes throughthese streams, the material can burn up in the atmosphere to create meteorfireballs. Forexample, the Leonid meteor shower ? which arrives each year in mid-November ?is caused by the remains of the comet Tempel-Tuttle. Two other meteor showers,the Aquarids of May and October's Orionid shower, are caused by the famedHalley's Comet.